Samson was a British hard rock band formed in 1977 by guitarist and vocalist Paul Samson. 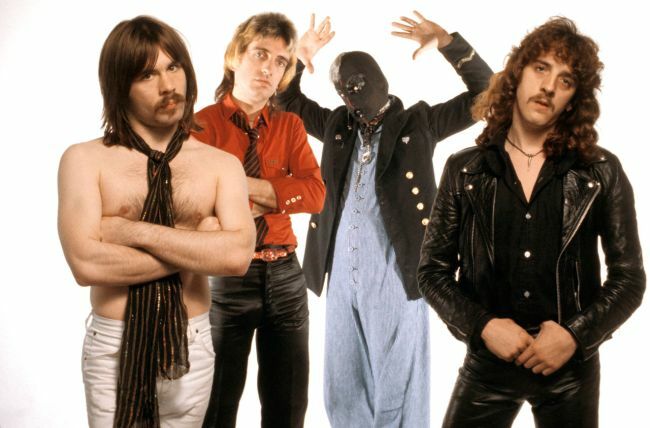 They are best known for their first three albums with future Iron Maiden singer Bruce Dickinson, then known as “”Bruce Bruce””, and drummer Thunderstick (real name Barry Graham), who wore a leather mask and performed on stage in a metal cage. Drummer Clive Burr was also member of the band, both before and after his tenure with Iron Maiden. BIZARRE SONG FROM THE 80S HORROR MOVIE INCUBUS. Bruce Dickinson on vocals! Sounds a bit like GILLAN. Of course, Ian Gillan was the biggest influence of Bruce. Also check the similarity with “everybody wants to rule the world” by tears for fears. Samson was the founder, guitarist and guiding light of the New Wave Of British Heavy Metal act that bore his name. Born Paul Sanson on June 4, 1953, he sang lead vocals on Samson’s 1979 debut, Survivors, produced by John McCoy of Gillan, (despite Bruce Bruce, later Bruce Dickinson, appearing on its sleeve). Bruce debuted with the band on the following year’s Head On, which had a cover starring the band’s notorious, mysterious masked drummer Thunderstick. Head On was a remarkable, powerful album, full of unusual rhythmic patterns and unconventional song structures, but although it was awarded five stars by Geoff Barton in Sounds the band’s fate had long since been sealed due to the signing of a restrictive management deal. A legal dispute with said company prevented the band from earning money for a year and delayed their next record, Shock Tactics, until the spring of 1981 – a lifetime at such a pivotal point in Samson’s career. That same summer, following triumph at the Reading Festival, Bruce was invited by Iron Maiden to replace Paul Di’Anno. “We had still believed that a hit single was all it would take for us to catch up with Maiden and Def Leppard,” Paul later told me. The news of Dickinson’s exit was a hammer blow. “They [Maiden] had their next two years mapped out, whereas we sometimes didn’t know what we’d be doing the following week,” he sighed. Former Tiger man-mountain Nicky Moore joined Samson for Before The Stormand Don’t Get Mad, Get Even. Paul then made solo records and formed the band Paul Samson’s Empire. Increasingly, however, his heart was in the blues, though there were occasional Samson reunions – one of which Dickinson had threatened to be a part of until reconsidering at the last minute. A YouTube clip of Samson’s final ever gig at the Wacken Festival in 2000 features the song Test Of Time and sums up the group’s inner, fun-loving dynamic. Samson and Nicky Moore recorded a new Samson album, provisionally entitled Brand New Day but posthumously called PS…, and released under his own name. He invited me to his house in Norfolk to hear it. By then Paul knew he had developed cancer but was facing up to things with bravery and the usual dose of humour. Returning to London I knew I’d never see him again. His funeral, attended by former Samson/Maiden drummer Clive Burr, Thunderstick, Samson bassist Chris Aylmer (who died in 2007), John McCoy, Bernie Tormé, and members of Saxon, Angel Witch, Praying Mantis and Fastway, was emotional. Paul had requested that The Laughing Policeman be played as the mourners filed from the church. Lady Luck was never kind to Paul Samson, that’s for sure, but he left behind a fine body of work. An autobiography remains unpublished. SKU: YP-8411 Categories: All Genres, NWOBHM, Search by Media Type, 12 ", 12" Picture Discs, NWOBHM 12"